The Wilshire Village Apartment complex is the only remaining development of three original Federal Housing Administration-insured sites, the largest undertaking of its kind approved by the FHA in the South. 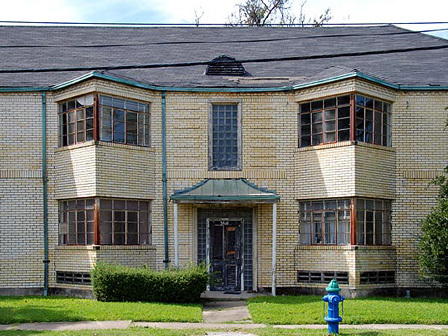 Finished in 1940, the garden apartment complex had 144 apartments of varying sizes in 17 two-story, fireproof buildings on a nine-acre site in the Montrose area. Architect Eugene Werlin created the “modern” look with brushed aluminum banisters, glass blocks and projecting window bays. A team of professional gardeners maintained the extensive landscaping. After many years, maintenance became the responsibility of the individual tenants, not the owner. As a result, not all apartments are well maintained and the building exteriors appear derelict. The complex is located in the midst of several historic subdivisions. In 2005, the property sold to a developer who announced preliminary plans to erect two 16-18 story residential towers on a site. This plan threatens the character of the adjacent neighborhoods, and the mature oaks and magnolias that were planted on the site 65 years ago.